Home » Blogs » Charles Gaba's blog » Huh. 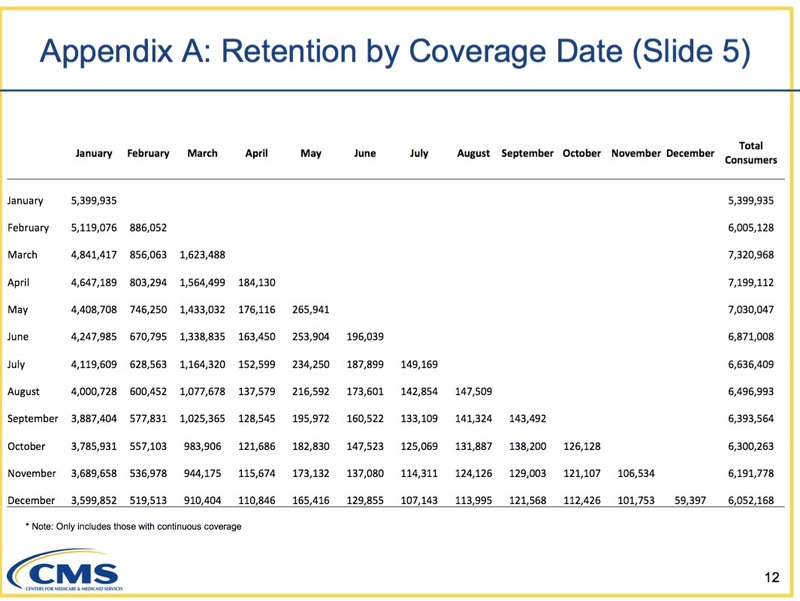 State-based exchanges appear to be better at retaining enrollees year-round than HC.gov. The only catch here is that this table only includes HealthCare.Gov states, not the more than a dozen other states which operate their own exchange sites. Now, 8,838,291 people actually selected policies via HC.gov during the 2015 Open Enrollment Period out of 11,688,074 nationally, or roughly 75.6% of the total. I naturally assumed, therefore, that the monthly retention/attrition rate would probably be around the same...that the numbers in the table above should represent around 76% of the national total each month. It turns out this is wrong. March: 10,187,197 nationally vs. 7,320,968 on HC.gov: HC.gov made up 72% of the national total. June: 9,949,079 nationally vs. 6,871,008 on HC.gov: HC.gov only made up 69% of the national total. Sept: 9,313,323 nationally vs. 6,393,564 on HC.gov: HC.gov only made up 69% of the national total. Dec: 8,780,545 nationally vs. 6,052,168 on HC.gov: HC.gov only made up 69% of the national total. In other words, the SBMs are (or at least were, in 2015) doing a MUCH better job of retaining enrollees throughout the year than HC.gov does/did. How much better? In March, SBM states had 2,866,229 effectuated enrollees out of 2,849,783 OE2 signups (100.6%)...yes, thanks to SEP additions (and Massachusetts' special year-round "ConnectorCare" policies), the SBMs managed to have more people enrolled, paid and effectuated in March than had officially signed up as of the end of Open Enrollment. As noted above, Massachusetts accounts for part of this, since they allow people to enroll in some categories of exchange policies year-round rather than limiting them to the official enrollment period, but that only accounts for a small part of this deviation, since MA only makes up around 1.2% of national enrollees and only 5% of the SBM enrollments. The only other factor I can think of which makes sense is that the SBMs might have been stricter about enforcing/verifying SEP enrollments than HC.gov in 2015? Anyway, it's an interesting little quirk.